If you need some distraction from the grindstone for a few minutes why not check out this small collection of hilarious memes about Engineers. You won't be disappointed. Engineering isn't funny. It is deadly serious and should only be pursued by the most dedicated and diligent professionals. Yeah right. Even engineers are allowed to have a laugh, that's where these hilarious memes about Engineers and engineering come into their own. We've had to include some obligatory ones, like the "Hide the Pain Harold" type, but the rest are some of the best we found scouring the dark underbelly of the world wide web. 1. No meme list is complete without "Hide The Pain Harold"
One simply cannot compile a list of memes without a "Hide The Pain Harold" example. Since we are required to add one, here is a vaguely engineering-themed meme. Procrastination, as anyone will tell you, is the best way to avoid life's inconveniences like, say, exams or work. But every action has a consequence, as is perfectly exemplified by Harold's classic look. To be honest, the message or text is secondary to Harold's bemused expression. But, this one is perfectly serviceable. Interestingly, the real-life story of the actor behind these memes is fascinating. Here is a fascinating interview about how his life changed after becoming internet royalty. Nothing brings Civil and Chemical engineers together like concrete. This material literally, and figuratively, builds a bridge between these two disciplines. 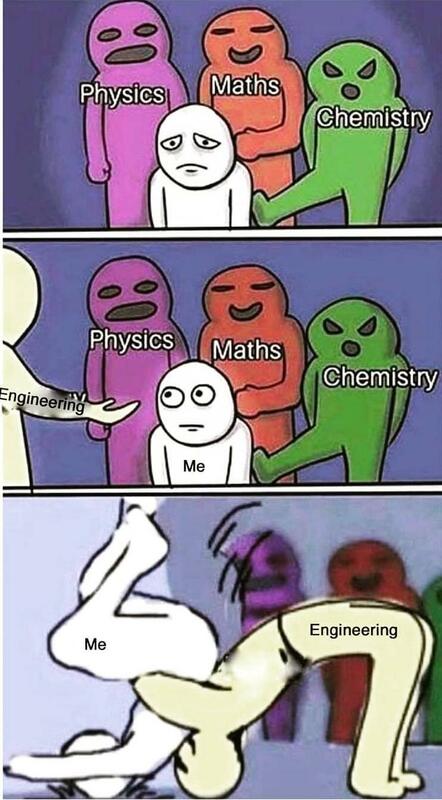 The feeling of camaraderie that it brings to these engineers is unsurpassed, and this meme perfectly sums up the feeling of brotherhood between them. At least until the project is finished - when they return to their mutual distrust, suspicion, and hatred for one another - so sad. If only every day could be filled with concrete-related tasks to ensure mutual peace and respect for all time between Civil and Chemical engineers! We can but dream. As any engineering student or 'grown-up' professional will tell you, it’s a hard life. Long days often roll over into the nights, and sleep is something you can catch up on when you die. You also forget the meaning of esoteric concepts like 'happiness', 'relaxation' and something called 'holidays'. Apparently, there are some people who actually don't work for a week or more, enjoy themselves, and get to 'have a lie in'. Yet others have things called 'hobbies' that they perform during their free time. And, amazingly, these often have nothing to do with their professions. What strange times we live in. How does anything get done outside in this other world? 4. Trust me I'm an Engineer! 99% of Engineers admit the only real reason for pursuing a career in engineering is to be able to say the immortal phrase "Trust me I'm an Engineer". True fact. So in honor of this worthy excuse for slaving through university, here is a fine collection of some of the funniest memes on this subject. They range from an excellent use for an old Pringles tube to using a straw as a faucet or tap and, and some ingenious uses for old plastic bottles. Frankly, the only real limit to an Engineers ability to jerry-rig solutions to a problem is their imagination. Are you constantly left in the cold at night? Does your partner constantly steal the lion's share of the duvet cover? Then why not take inspiration from this meme. With good use of a hammer and some nails, you will always get a good night's sleep. Though be sure to hammer quietly when preparing this solution. You may not live through the night if you wake up your duvet-stealing partner! This is actually very tempting to try in reality. Where is my toolbox? 6. What is the difference between C and CE on a calculator anyway? Come on admit it, you don’t really know it either. Everyone and we mean everyone, does this everytime they clear their calculator. To be fair the main reason is that you know that one clears everything, and the other just the last entry - but which is which? Such mathematical roulette is very stressful indeed. As it turns out the C button is supposed to clear all input into the calculator. The CE button, in contrast, is designed to only clear the most recent entry thus preventing the need for you to delete a long computation. Apparently, that is. This could be trickery so just keep pressing each one multiple times to be sure! You're probably more than familiar with the WD-40/duct tape decision flowchart. If not it provides a foolproof method of determining the right decision to make when attempting a basic repair. First of all, check if the subject object is moving. Then you'll need to determine whether it's supposed to or not. Your final answers will then let you know whether it's not a problem or if you'll need to grab your WD-40 or duct tape. Of course, it should be implicit that this only really relates to inanimate objects. Either solution is unlikely to raise the recently-deceased - sadly for Simba. Of course, the lubricant-purists will likely throw a fit at any suggestion of using WD-40 for such a purpose. Apparently, you’d be better off replacing it in the above flowchart with "the correct lubricant" or at least CorrosionX instead. Chill man, chill. We are pleased to see that duct tape passes muster though. Any suggestion of swapping that out would be tantamount to engineering sacrilege. The creator of this meme also helpfully points out that you can use a hot glue gun or screws to help stop things moving that really shouldn't be. In a world where you are constantly tormented by Physics, Maths, and Chemistry, Engineering offers the promise of salvation. Down on your luck, you place your trust in it - surely the grass is greener on the other side. But Engineering is a tricky and fickle mistress. As sure as day turns to night, it will quickly reduce you to a gibbering wreck in short order. All of a sudden your previous tormentors don't seem as problematic as they once were. Hindsight is always 20:20, as they say. It will make you wish you'd never bothered getting up. Or becoming adult for that matter. Woe is you. Whoever said "don’t work hard, work smart" was never paid by the hour. Take this ingenious fella's solution for re-inflating this giant tire. He is a true master of maximizing his income whilst appearing to be keeping busy at the same time. This solution should be a good earner on this contract. But wait, it's the gift that keeps on giving. Not only is he going to get a nice fat paycheck at the end of it but he's saved a fortune on a gym membership. Expertly done sir. We just hope he didn't maliciously deflate the tire beforehand.